Plants can grow in what appear to be the strangest places. 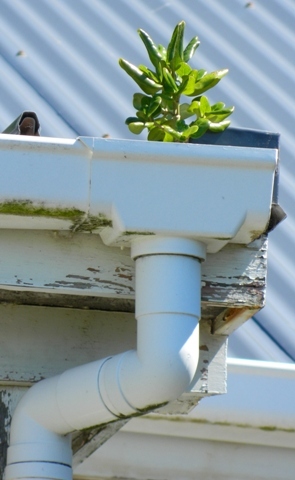 This can be frustrating for property owners (e.g., grass in the gutter; footpaths cracked by pohutukawa roots). But our view of plants is often from our own animal-centric perspective; unlike our zoological kin, an individual plant doesn’t have the option of moving to a better spot. Wherever a seed or spore falls is going to be the home of that plant for the rest of its life; that is, of course, if it even germinates at all. 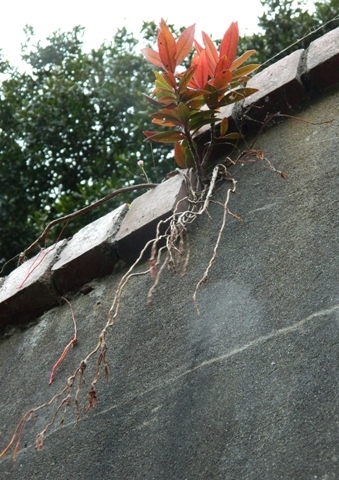 Grow, wherever you end up, or perish. are ‘plants out of place’. Image © to and courtesy of jMj. My first flat was here. of a dark damp cave. not native to this region. Tell that to the pohutukawa. Guns. Not much beside remains. What do you see in the plants in these images? Are they ‘battlers’ to be admired for making what they can of a bad situation? 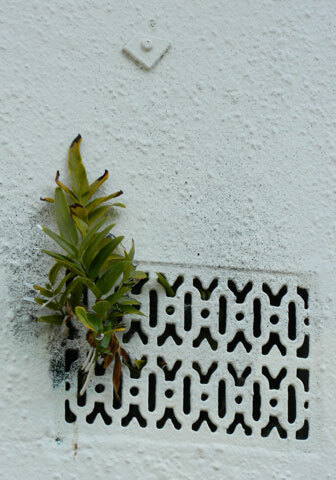 Or are they a reminder that plants would quickly envelop our urban world if we stopped pushing them back? Thanks very much to jMj for sharing these observations and the colour photos – the zine itself is in black and white. 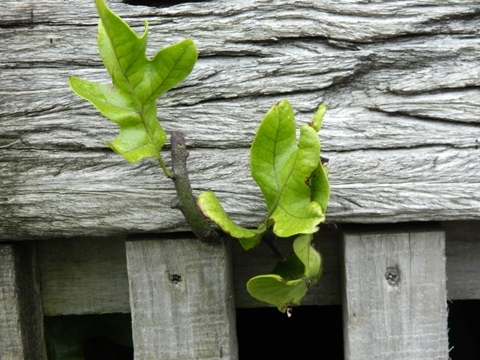 If you’d like to share with Te Papa’s blog your own images of plants growing in unusual places, here’s my email. Finally, if you haven’t already seen, here’s a lancewood that went straight to the top (and please excuse the pejorative title). A big wall might be impervious to damage. A healthy covering of plants might even help to stabilise the bank. But, rangiora can grow into a similar-sized tree as five finger, so perhaps it has similar potential to damage your wall. If your rangiora are already of a reasonable size (say > 20 cm), you might have trouble extracting them from the wall without fatally damaging their roots. Most plants need a good amount of intact substrate around their roots in order to be successfully transplanted. However, you could grow your rangiora on via cuttings. I’ve got some cuttings of a hybrid between rangiora and another Brachyglottis species at home and they are thriving. All I did was cut off about 5-10 cm of a new-growth stem, remove all but 3-5 leaves (to reduce water loss, since the cutting has no roots to take water up), dunk the cut in rooting hormone (auxin, from garden centres), and stick in moist potting mix (which needs to be kept moist). How very creative and original. Love the persepctive and how it encourages us to observe our environment more closely. Are these plants rebels or opportunists? That reminds me of a pohutukawa I saw during my holidays in Punakaiki, growing on the roof of a shed, and it was nearly 1.5m tall too! Had I known, I would have taken a photo of it. Now on that subject of plants growing everywhere, I’ve got rangiora growing in the honeycomb of a retaining wall. I haven’t had the heart to cut them because I love rangiora, but I was wondering whether I should consider moving them to a better home. Would they roots be able to grow so big they’d dismantle the honeycomb? (It happened with a Five fingers just a few meters away). Admittedly attractive, but despised by conservationists for its invasiveness. I used to walk down to Owhiro Bay when we lived in Brooklyn, and just loved seeing the wild flowers up above on the hills.. one was a lilac coloured flower, no photographs and live up in Wairarapa now, but miss seeing the wild flowers! perhaps one of the daisy family? 1) shining spleenwort fern (Asplenium oblongifolium) – a native NZ fern. 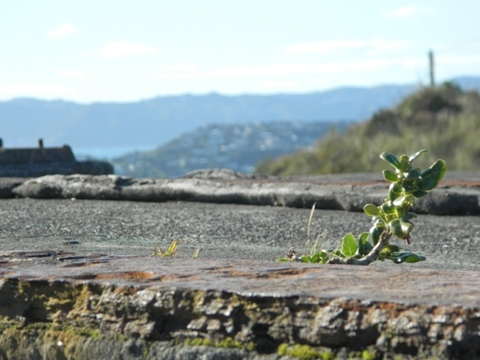 2) taupata (Coprosma repens) – a native NZ shrub. 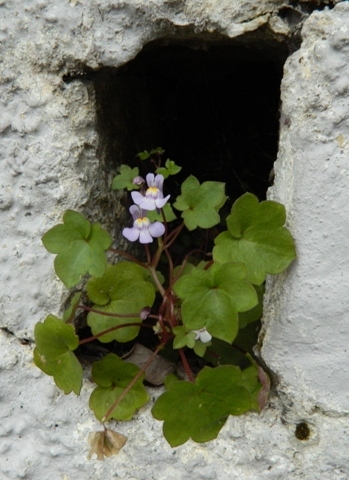 3) ivy-leaved toadflax (Cymbalaria muralis) – an introduced herb (and I use ‘herb’ in in the ‘non-woody’ rather than edible sense). 4) pohutukawa (Metrosideros excelsa) – juvenile of a native NZ tree. 6) hound’s tongue fern (Microsorum pustulatum) – a native NZ fern.